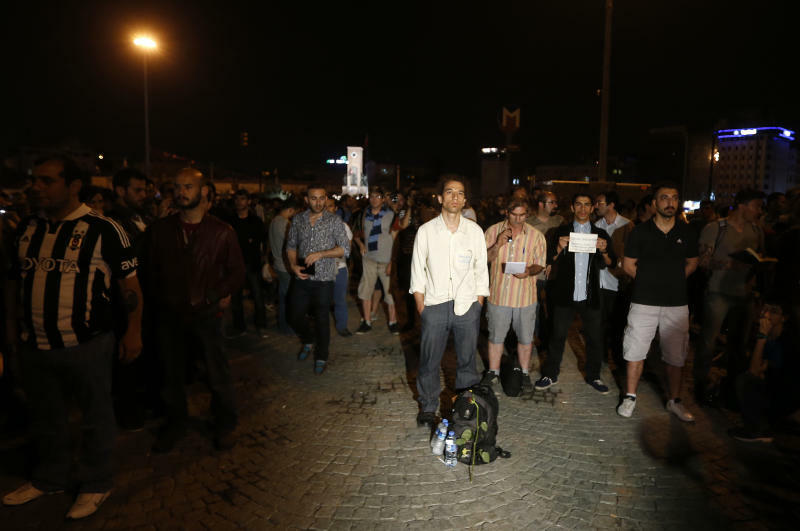 ISTANBUL (AP) — After weeks of sometimes violent confrontation with police, protesters in Turkey have found what could be a more potent form of resistance: standing still. The trend was launched by performance artist Erdem Gunduz, who stood silently for hours in Istanbul's central Taksim Square on Monday night, in passive defiance of Prime Minister Recep Tayyip Erdogan's violent crackdown on environmental protesters at a park adjacent to Taksim. The square has been sealed off from protesters since police cleared it over the weekend, though pedestrians can still enter. As Gunduz stood there, others gradually began to join him — and later to replicate his protest in other cities in a wave of imitation driven by social media. Gunduz apparently made no announcement before he paused Monday evening in the square and didn't move. He stood with his hands in his pockets, staring at an image of Turkey's founding father Mustafa Kemal Ataturk, whose admiration is rooted in his success in imposing secular values on a largely Muslim nation after the collapse of the Ottoman Empire 90 years ago. When police arrived an hour later, Turkish news media reported, they searched his pockets and his backpack, then left. Gunduz stayed put. For hours. When asked by reporters what he was doing, Turkish news agency Dogan said, he responded: "It's evident. The people are not being allowed into Taksim." Witnesses began calling him "duran adam" — "standing man." Some joined him in Taksim, while others began doing the same in other Turkish cities. 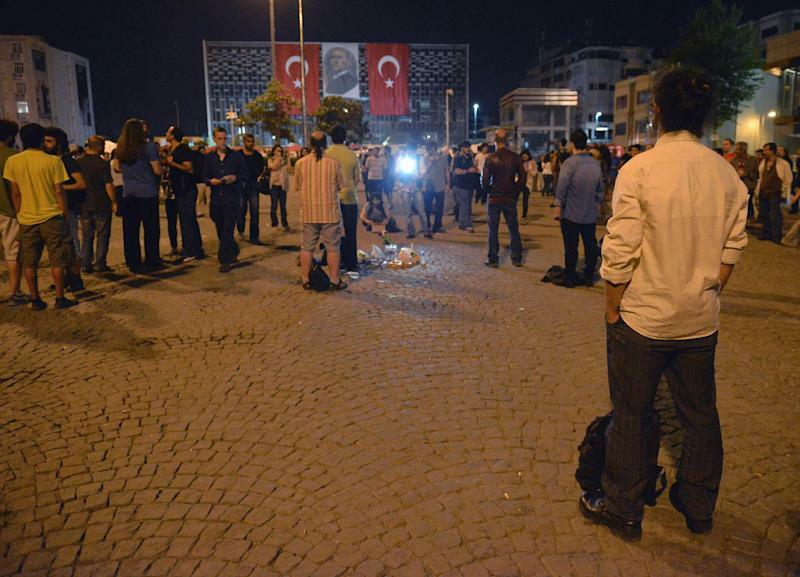 In Ankara, the capital, a woman stood still at the spot where a protester had been killed. Early Tuesday morning, police intervened and dispersed the crowd around Gunduz, detaining several protesters. It wasn't clear whether Gunduz was among those arrested, though he was free later Tuesday. Later Tuesday, others returned and began silent vigils. Patrick Adams, an American freelance journalist, said his friend and neighbor is a dancer originally from Izmir, Turkey's third-largest city. Gunduz has a degree in fine arts, he said, and has been doing street performances for years. Adams said he doesn't know Gunduz to be politically active, but isn't surprised by his silent act. "He's completely courageous," Adams said. Adams said Gunduz sent him a message Tuesday to say that he was at home and doing fine. Gunduz couldn't be reached directly. Gunduz's act, amplified by social media, had a remarkably swift effect on the protests. Erdogan appeared to be seizing the initiative after large weekend rallies in which he ordered Taksim Square to be cleared. The government has capitalized on sporadic scenes of violence amid the generally peaceful protest movement. Gunduz's act of non-violence could be harder to deal with, as it could pressure the government to arrest or disperse people who are doing nothing more than standing still. Interior Minister Muammer Guler said authorities wouldn't intervene against any demonstration that doesn't threaten public order, but that pledge could be tested quickly. Activists called for a nationwide standing protest later Tuesday. "We need to congratulate him (Gunduz)," said Ozgur Volkan, who joined the standing protesters in Taksim. "He started up a very great movement."